Most corporate legal departments receive hundreds of legal service requests, including requests that are not considered legal matters, such as contract reviews and compliance issues. Without the proper tools and processes, managing this volume of work can lead to lack of visibility and the potential of lost or mishandled requests. The new powerful enhancement in CounselLink® enterprise legal management (ELM) solution helps legal departments to efficiently evaluate legal requests, track the status of requests, and provide valuable, targeted reporting on activities associated with the work within CounselLink. This dynamic tool also allows business partners (internal teams, outside law firms, vendors, etc. ), who do not use the CounselLink ELM system, to submit requests. The legal request feature in CounselLink provides analytics directly within the application to easily report on the number of active requests, who is working on them, how long it is taking to complete tasks, and more. The advanced reporting capabilities provide legal departments with the data necessary to measure and evaluate the impact of each request, identify barriers, provide status notifications, and prioritize work. The CounselLink team understands the unique demands of corporate legal departments and is dedicated to meeting their needs through constant research and innovation. As pioneers in the business of law sector, the CounselLink team continues to develop state-of-the-art features, such as the new legal request tool. It’s designed to assist with the individual requirements of complex businesses so that legal staff can manage their matters, risk, and legal spend with maximum efficiency. In fact, CounselLink received a Highly Innovative distinction for the legal request feature from Hyperion Research in the recently published Enterprise Legal Management VendorView Evaluation report. 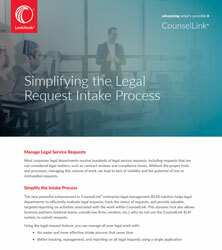 To learn more, see The Benefits of Legal Request: A Customer Perspective blog post on the LexisNexis® Business of Law blog.